Suspended by the winch? Indeed so. 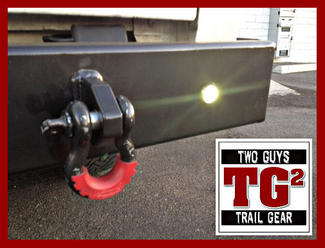 Two Guys Trail Gear has heard lots from our customers about how happy they are to have found our bright and shiny LED lights which, in turn, makes us happy, bright and shiny, too! or not to buy our lights. 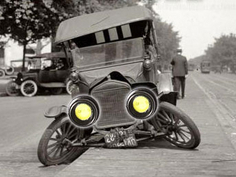 If you have questions or need clearer details, by all means, give us a call. We're here and very ready to help! Two Guys Trail Gear's been spotted in good company! 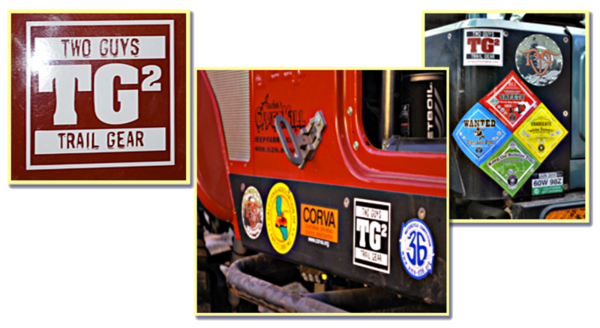 Two Guys Trail Gear supports trail access ~ anywhere and everywhere. Our friend and off-road colleague, Colin, was spotted at Loon Lake, sporting his Generation One Two Guys' LED rock lights. 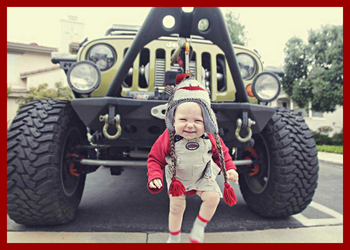 Rumor has it they came in quite handy on his maiden voyage along the Rubicon Trail. 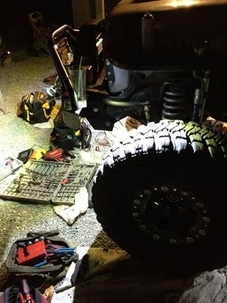 This summer, TG2 amber turn signal LED's were spotted on our jeeping compadre Darren’s rig at Spider Lake. 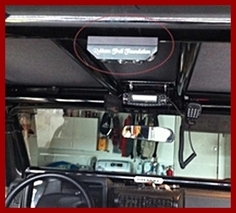 While checking out Derek's new ham radio install, we Two Guy's noticed his brilliant use of our special edition 3x5 LED light bar, complete with custom RTF laser engraving and a magnetic roll bar mount for interior lighting. Nice job, Derek, and congratulations on obtaining your ham operator's license! On Art's birthday, he decided to make a few small repairs to his jeep. Fortunately, these repairs started during full day light; unfortunately, these "few small repairs" stretched into full moon light! At first, due to low light conditions, he thought it'd be too dark to finish his minor modifications. 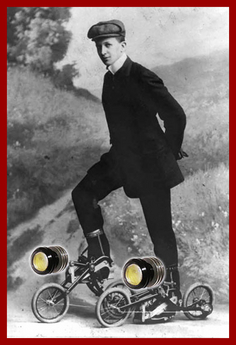 But very soon Art remembered he had Two Guy's Trail Lights! With a simple flick of the switch, there was lots of light. Sleep? Not so much. TG2 LED's... in a blaze of glory. 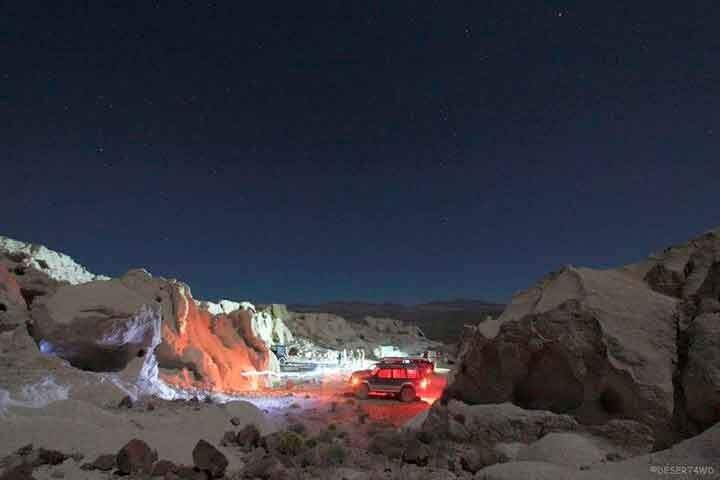 A few months ago, our previously-mentioned good friend, Art, tested TG2 LED's, Stud LED's and our 1x5's while attending the King of the Hammers 2013 free-for-all. Although the trip was peppered with minor malfunctions, busted these and flattened those, all in all, a good time was had. The sun shined, the dust blew, the beers drained and the rigs flew. 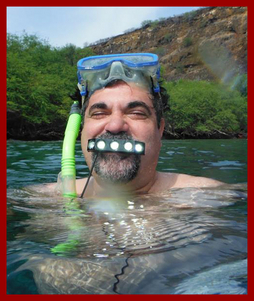 Needless to say, Art was extremely pleased with his new LED gear... and very well lit, too! Derek, another of our Partners-in-Climb, joined Art at the KOH event. We're not sure if this was his first time at the outdoor extravaganza but like any true KOH speedster, he let nothing get in his way. 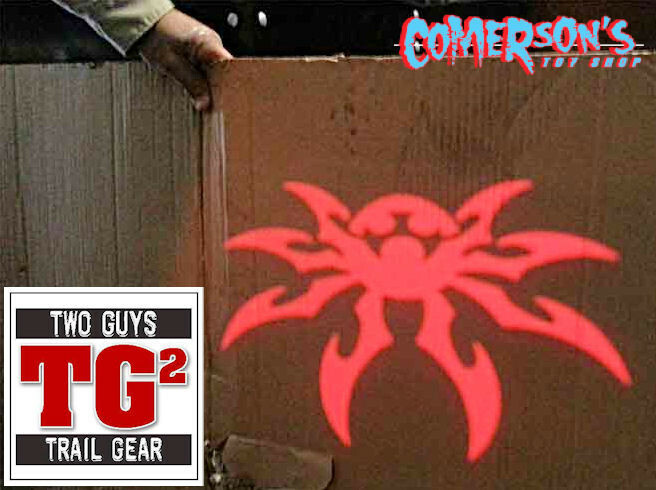 "The Two Guys Trail Gear LED lights are amazingly bright. 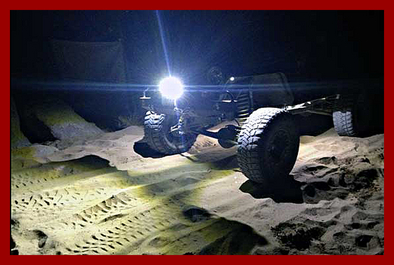 During this season's KOH event, we made a few night runs that would not have been possible without the good, clear light that these fantastic and powerful LED's put out." Two Guys LED's successfully turn night into day in Death Valley, 2013! Again, although it looks like a wonderful way to illuminate 20,000 leagues under the sea, there's no product return if you decide to try it yourself. Sorry! Another faithful wheeling aficianado, Glen from Praxair, picked up two TG-101 studs at the Pomona Off-Road show. 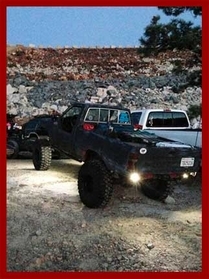 Check out Glen's awesome Jeep Comanche Bumper, all lit up! to cast this evil image of Spider's logo onto, um, one fine piece of cardboard. If you or your dusty compatriots find yourselves using Two Guys Trail Gear LED's or accessories in, shall we say, "amusing" ways, email us a quick note and photo. You just might end up on this illustrious Testimonials page!